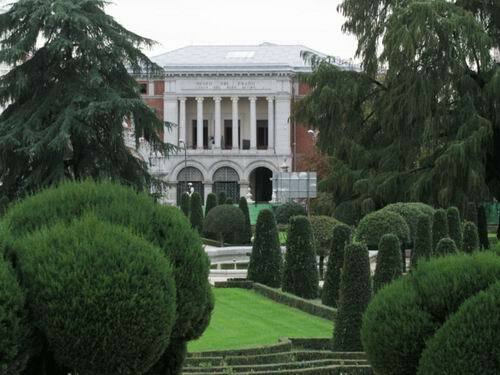 Casón del Buen Retiro is an early Baroque building that is now part of the Prado Museum in Madrid. The Casón del Buen Retiro forms part of the Prado Museum today, but began life in 1637 as a ballroom for the Buen Retiro Palace (Palacio del Buen Retiro). It is the only building which remains of this old palace and grounds, which were built for the Conde Duque de Olivares during the reign of Felipe IV. The gardens originally contained a number of buildings and pavilions, and what remains of the gardens today forms the Retiro Park. The Casón faces one of the park's entrances across what is now the busy Calle Alfonso XII, and is unmistakable with its tall facade and four enormous classical columns and neoclassical design. The early Baroque building is attributed to the architect Alonso Carbonell, but work continued until the latter part of the 17th century under José del Olmo. In the early 19th century, its baroque flavour was altered, and in 1868 it was nationalised by the revolutionary government, becoming the Museo Nacional de Reproducciones Artísticas. In the interior, main hall is notable for its decorated ceiling by Luca Giordano, who painted it in 1695. Giordano was a Neopolitan painter who served for ten years as Court Painter to the Spanish King Charles II , from 1792 to 1802. He painted prolifically during this time, producing works for the Royal Palace and Escurial Monsatery, as well as in Toledo. The facade seen today is not the original. In 1887 the front of the building seen from the Calle Alfonso XII was redesigned by Antonio Felipe Peró, Manuel Antonio Capo and Mariano Carderera, and a few years later the main façade had to be restored by the architect Ricardo Velázquez Bosco when it was all but destroyed during a cyclone in 1886. Since 1971, the building has formed part of the Museo del Prado, and houses important 19th century collections, although it has suffered from closures for renovation work. The best way to get to the Casón del Buen Retiro is to take the Metro to Retiro or Banco de España, and walk via the Puerta de Alcalá into Calle de Alfonso XII. The building is a short stride from the Royal Botanical Gardens, as well as Madrid's major museums, the Prado, Thyssen-Bornemisza and Reina Sofia. Across the road from the building, a walk through the park makes a pleasant break from the noise and bustle of the city, and a visit to the Palacio de Cristal and Velázquez Palace in the park are well worth while.